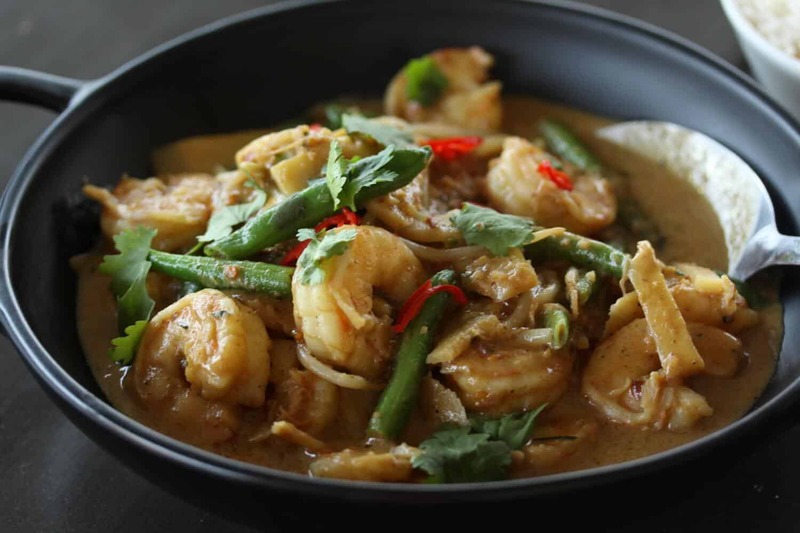 A spicy, peanutty Thai Panang Curry filled with big, juicy prawns (shrimp). Ok, so Penang is a popular holiday destination in Malaysia but this is a different type of Panang. Thai Panang Curry, in fact. You’ll find this on the menu at your favourite Thai take-away and I found this when we went out with some friends to a lovely Thai restaurant a few weeks back. 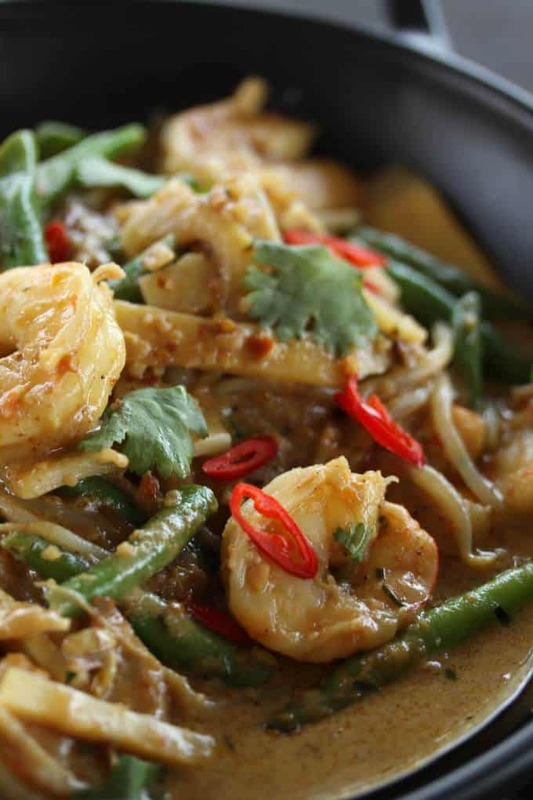 What’s your go-to Thai dish? Cashew chicken, all the way for me. Until now that is. I’m a huge fan of share-food or share dishes. Basically any dish you can throw in the middle of the table and everyone grabs a little bit of everything. I think it’s because there is no chance of me getting food envy (from which I suffer REGULARLY). Hehehe. So, we went out for dinner and each ordered a dish. Someone ordered the Penang Curry with Chicken and it was by far my favourite dish of the evening. 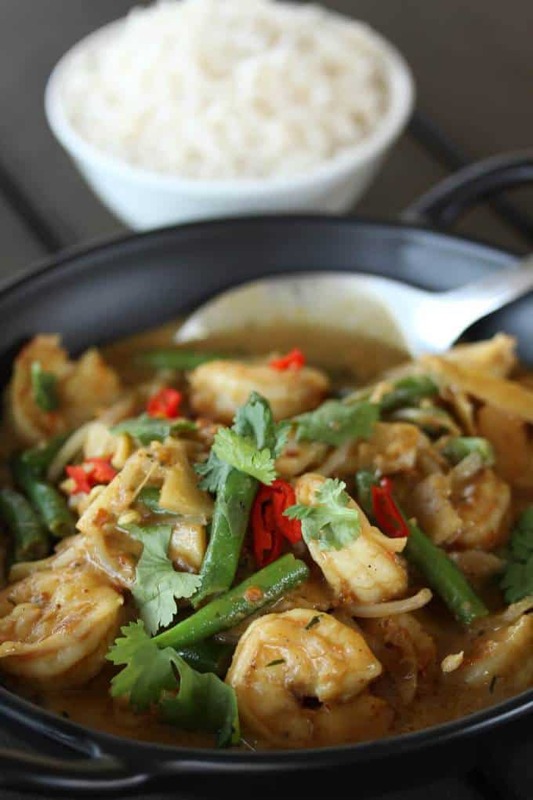 It’s a coconut based warming, spicy curry with a distinct peanut flavour. It’s like Satay and Curry all in one. Yum, yum. Now, you could make the curry paste yourself from scratch but that’s a whole long list of ingredients you might not readily have or want to be leftover with, so I simplified this version by using a shop-bought Thai red curry paste (as I couldn’t find a Panang Curry Paste). I then added the extra ingredients to turn that into a panang curry paste. From all my research, this seems to be quite an acceptable substitution to make. It also makes the shopping list SO much easier to get through. I will, one day, try to master my own red curry paste from scratch and I’ll be sure to let you know when I do. If panang curry paste is available, then by all means use that, but as you won’t use a full jar, you may be left with paste that you can only make Panang Curry with. Not such a bad thing, right? But if you use red curry paste, you can make a number of delicious curries. So this Penang Curry is sweet, rich and creamy. Traditionally it is made with coconut cream rather than coconut milk resulting in a thicker sauce that is just meant to coat the meat or veg that you use. I used a combination of coconut milk and cream as I like a bit of extra sauce for my rice. So delicious. In a pestle and mortar pound together the spices and shallots. Add the peanuts and pound to grind them up too. Add the red curry paste and mix together thoroughly. Heat the oil in a wok over high heat and fry the mixed curry paste for a minute or so until nice and fragrant. Add in the coconut milk and let the mixture boil until it is reduced to about half. Add the prawn meat and cook, stirring, for 2 minutes. Add the green beans and cook for another minute. Add in the rest of the ingredients (coconut cream, palm sugar, fish sauce, kaffir lime leaves, bamboo shoots and bean sprouts) and stir for a minute or two until everything is heated through and cooked to your liking. If the sauce becomes too thick, you can add a little water or more coconut milk to thin it out a little. Taste the sauce and season with a little more fish sauce if required (be careful as it is quite salty). Shrimp curry is my favorite kind of curry. I also loved that this recipe calls for bamboo shoots. I used to eat that all the time growing up, definitely going to be a keeper!